Organic is big business, and with demand far outstripping supply, big food companies are buying up farmland to keep shelves stocked, a trend which raises questions about the benefits to farmers. It’s a simple frame—supply will naturally meet demand—but when it comes to certified organic food, it hasn’t quite worked out that way. In the seven years since the film debuted, demand for organic food has soared to nearly $36 billion in 2014. At the same time, the supply of organic ingredients is trailing far behind, forcing many food companies to import organic raw ingredients from overseas. While organic sales reached nearly 5 percent of total food sales last year, organic farmland makes up only about 1 percent of U.S. farm acreage. Farmers like Roush and many others want to meet the growing demand for organic, but are faced with several challenges to increasing acreage. Most significantly among these is the three-year transition period set by the U.S. Department of Agriculture (USDA) in which farmers can’t use chemical fertilizers or pesticides. Farmers take a hit on upgrading to new practices (specifically paying for more labor and new equipment) and can’t generally market their transitional crops at a premium during this period. In addition, affordable farmland and crop insurance have largely been unavailable for organic producers. Despite these challenges, more farmers are transitioning to organic than ever; last year, the number of certified organic operations in the U.S. grew by almost 12 percent—more than double the growth rate of 2014. In order to meet the growing consumer base, some businesses are seeking to level the (organic) playing field by investing directly in organic farms and farmers. Take Nature’s Path. The company has been investing in farmland since 2008 to ensure that it has enough organic grains to produce its cereals. Nature’s Path also joined Stonyfield Farm, Organic Valley, Clif Bar, and others to form the Organic Grain Collaboration to work together—and not compete—to address key challenges in expanding the supply of organic grain in the U.S. Since 2009, General Mills has increased the organic acreage it supports by 120 percent and is now among the top five organic ingredient purchasers—and the second largest buyer of organic fruits and vegetables in North American. This summer, the company announced a strategic sourcing partnership with Organic Valley, the largest organic cooperative in the U.S., which will help about 20 dairy farms add around 3,000 acres to organic dairy production over the next three years. 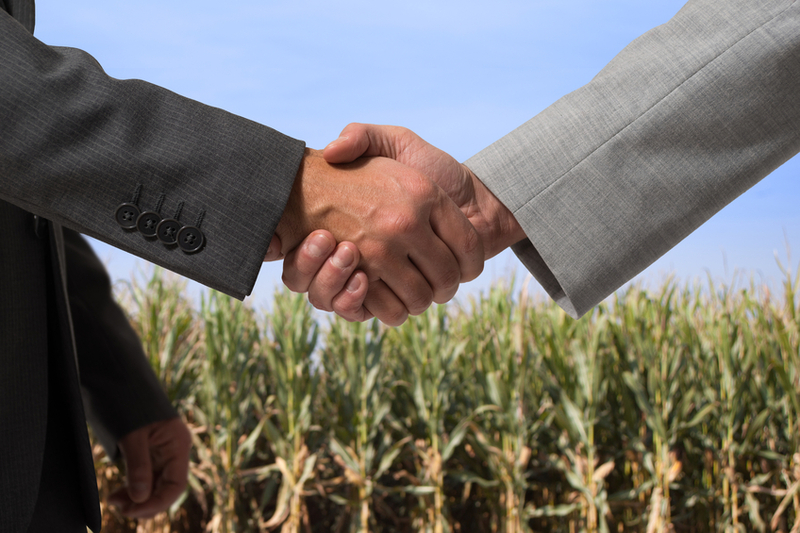 Some companies, such as wheat flour supplier Ardent Mills, largely owned by ConAgra and Cargill, are offering long-term contracts to transitioning farmers. The company aims to double organic wheat acres in the U.S. from the current 260,000 to 520,000 by 2019 and will pay farmers more for transitional crops. “One thing that has been very beneficial to us is that folks like Ardent Mills have added value to the crops we’re growing during transition,” Reed Gibby, founder and chairman of an Idaho-based agribusiness that invested in 2,000 organic acres last year, recently told the New York Times. Restaurants and retailers are also getting in on the act. Chipotle has provided financial incentives to help bean farmers transition from conventional to organic production in the Pacific Northwest, paying higher prices for the beans without being able to market them as organic. Fast-casual, organic-focused Dig Inn is set to buy its own farm and hire its own farmers. This move could spur a trend; for its first store in the Midwest, the salad chain Sweetgreen, which is also committed to locally grown foods and sustainable farming, had to develop a new farm supply and distribution system from scratch. Earlier this year, Costco, now one of the nation’s biggest sellers of organic food, announced plans to support farmers directly in order to ensure a steady supply of organic crops. The company is following in the footsteps of other retailers that have instituted programs to support suppliers—and presumably themselves—along the supply chain. For over a decade, Whole Foods Market has made $14 million in loans to support local producers. Seattle-based PCC Natural Markets has supported the preservation of farmland through its PCC Farmland Trust, which the co-op founded in 1999. While it’s obviously a boon for these companies to have a direct supply—and even better the planet to invest in organic and transition away from conventional—the trend raises questions about the benefits to farmers. Farming is a tough business and many farmers are being forced to sell their land or retire without succession plans or add agritainment attractions to be able to survive. Will investments by a large food producer ultimately keep small family farms on the land? Or are farmers being locked into exclusive agreements, signing onto long-term contracts that amount to vertical integration? And are there other opportunities for farmers to gain access to land and/or transition to organic in some meaningful way? Cereal maker Kashi announced a partnership with Quality Assurance International, an USDA-accredited certifying agency, and South Dakota-based Hesco to launch the new label, and even has a new cereal made with wheat from transitional farmland called Dark Cocoa Karma. Beyond the businesses that buy the crops directly, there are also some programs and loan opportunities to help farmers help themselves. Since 1988, the Sustainable Agriculture Research and Education (SARE) program has advanced profitable and environmentally sound farming systems that are good for communities through a nationwide research and education grants program. In California, farmers can borrow money from Farmlink or from a group of Rural Development Corporations that make loans to farmers and small businesses. The farm Capay Organic borrowed money to buy land from its community supported agriculture (CSA) members by creating a Green Loan Program. It’s a direct public offering (DPO) through the state of California that’s only available to state residents, which is admittedly an expensive way to raise funds, but is also being used by other California businesses. Access to land is a serious issue for both conventional and organic farmers. We’ve written about how institutional investors—including hedge funds, private equity, pension funds, and university endowments—are buying up farmland as an investment, and it’s worth reading the Oakland Institute’s report, Down on the Farm: Wall Street: America’s New Farmer, which looked at investors and pension funds, such as TIAA-CREF, the Hancock Agricultural Investment Group (HAIG), and UBS Agrivest—an arm of the bank’s global real estate division—and found that these groups have a bottomless appetite for farmland. But there are those who are trying to invest responsibly, including Farmland LP, Agriculture Capital Management Partners, Sustainable Farm Partners, Vilicus Capital, Iroquois Valley Farms LLC, and Dirt Capital Partners, all of which invest in farmland, either in partnership with sustainable farmers, or to their benefit. There are those who are supporting the idea of an organic checkoff program as a way to promote more organic production. And just this week, Politico reported that the Rodale Institute launched an advocacy group aimed at “uniting the nearly 20,000 organic farmers in the U.S. and give a voice to their policy issues.” It will be represented in D.C. by Elizabeth Kucinich, the wife of former Congressman Dennis Kucinich. Maybe this group will be able to bring organic farmers’ voices to the Hill to lobby for more support. As is often the case, public policy has been slow to meet the market’s demands. However we get there, let’s hope that farmers have a winning place in the race for organic. The masses will be able to afford to organic foods when they are forced to grow it themselves. Until then organic foods will remain luxury items available only to the 10%. We bought our small farm 14 years ago to supplement our social security income. It had been planted in corn and soybeans for generations. When I bought the land, there wasn't an earthworm on the entire 13 acres. I fallowed the land for 5 years before planting organic vegetables. After years of composting and cover-cropping, there are now dozens of worms in every shovel of soil. It was hard work but we now have an organic farm. But its very difficult getting financing for any improvements or expansion. Local banks won't even discuss financing. Although there has been much divestment in the fossil fuel sector, I've found that banks are still reluctant to invest in either sustainable farming or alt energy. I'm glad you found some alternatives. Land is always available for a price. If market demand for organic produce exists in excess of supply and the organic price premium holds true to form for veblen goods, why is public policy necessary to support organic agriculture? Fact is, even with organic premium pricing when you factor in yield drag with organics and the extra labor, not to mention the costly organic inputs, a transition to organic doesn't pencil out without favorable marketing locked in. It's a very risky venture and public policy cannot change that. What's needed are lenders willing and able to take on the risk to fund a boutique business. Market demand is meaningless without a robust credit market. Same old story - put your money where your mouth is.